Stairs with verdant rice crops. Surrounded by the abundance of coconut trees as if framing the area of Tegalalang with a more beautiful, natural and charming. It is amazingly beautiful. 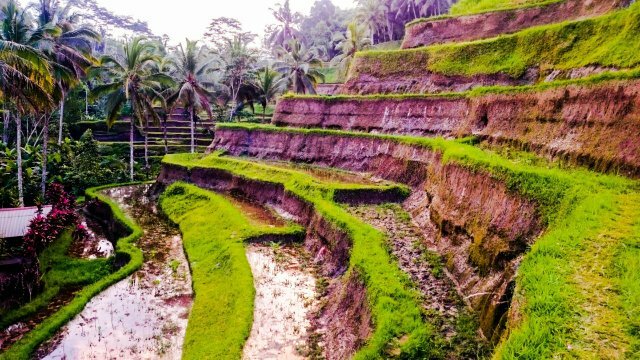 This location is also known as Ceking Rice Terrace, as it is located in Dusun Ceking, Tegalalang District, Gianyar Regency, Bali. Ceking Rice Terrace is one of the most popular rice terraces to visit. The beautiful Ceking rice Terrace is designed with exquisite hollowing rice field and precisely located on the hill bank. In this place, you will see the Balinese farmer do their rice field in the oblique area complete with its system called irrigation. Ceking Rice Terrace is one of the tourist icons in Ubud Bali.